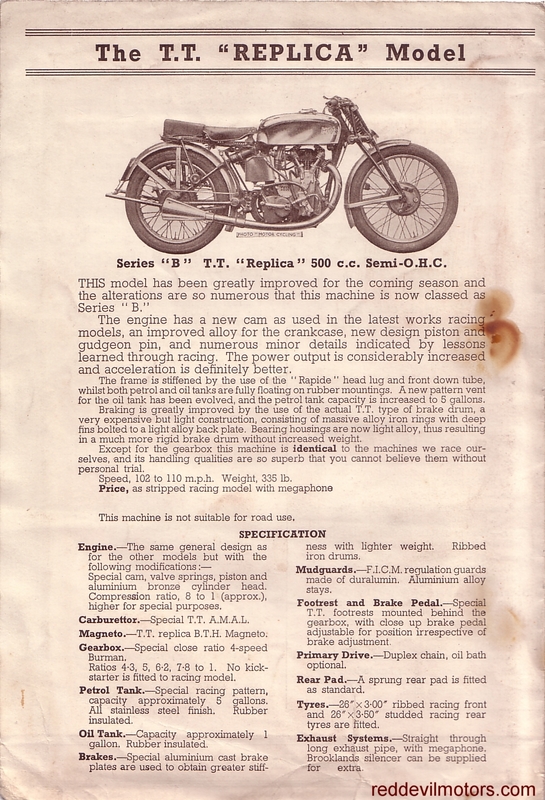 Nortons were quality bikes and they always produced quality sales material. In my humble opinion the '59 featherbeds were the best looking of post war Nortons. 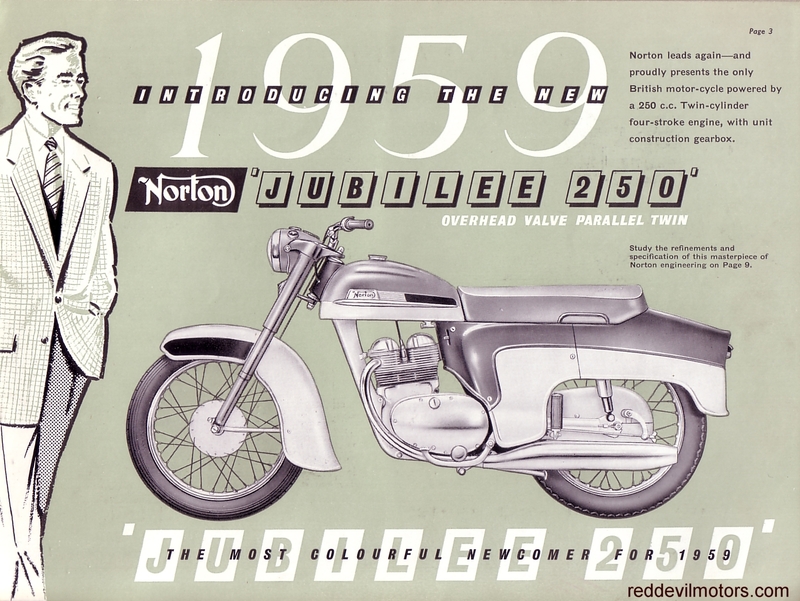 Let's however not talk about the 250 Jubilee launched to celebrate 60 years of Norton - nicely styled bike and the concept was good (look at the popularity of Honda 250 twins slightly later) but marred by cost cutting and cheapo parts. These last of the widelines possibly don't photograph as well as a slimline but in the flesh the lines are spot on. 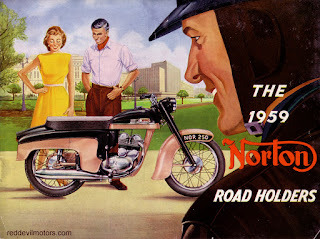 1959 Norton brochure front cover. 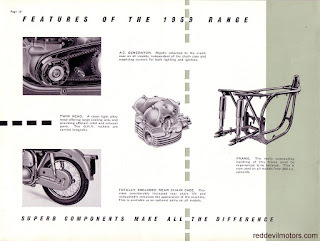 1959 Norton brochure page 1. 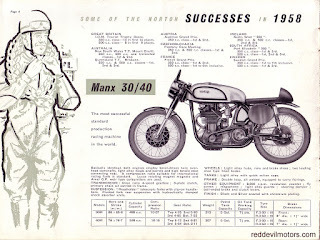 1959 Norton brochure page 3. 1959 Norton brochure page 4. 1959 Norton brochure page 5. 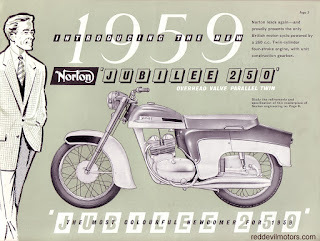 1959 Norton brochure page 6. 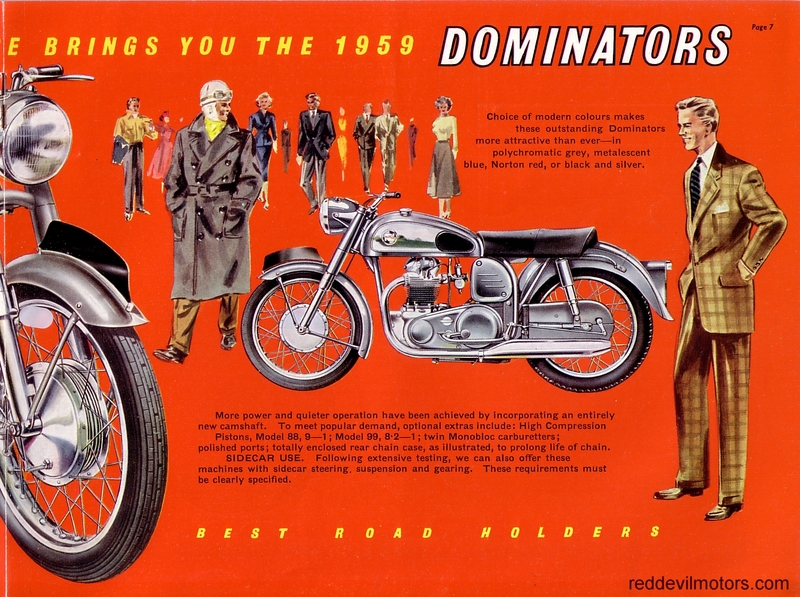 1959 Norton brochure page 7. 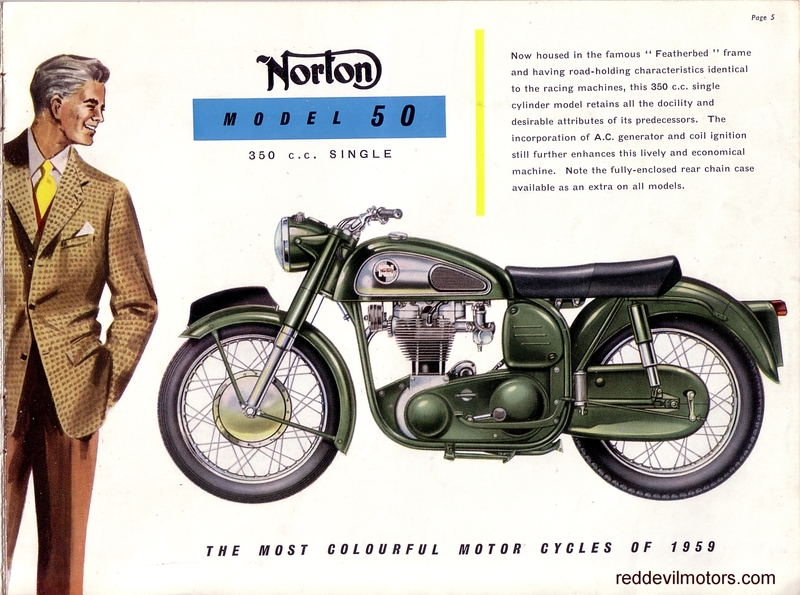 1959 Norton brochure page 8. 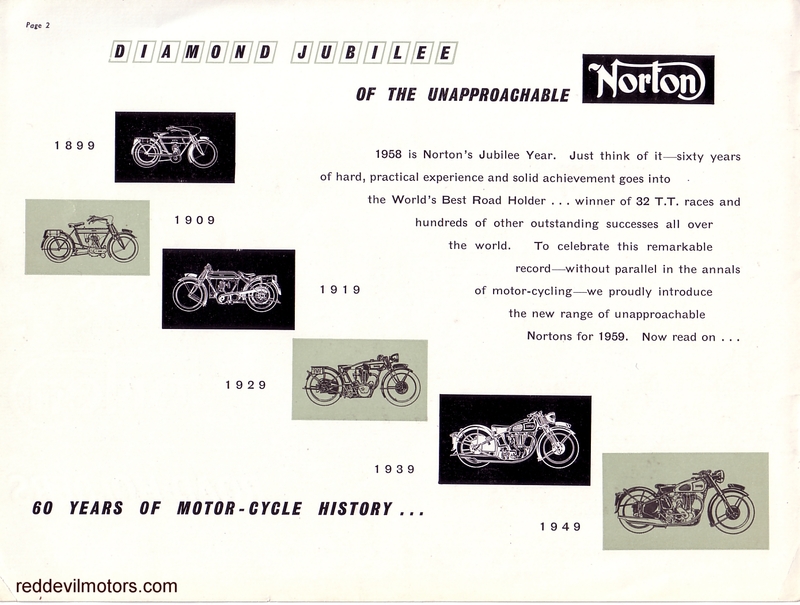 1959 Norton brochure page 9. 1959 Norton brochure page 10. 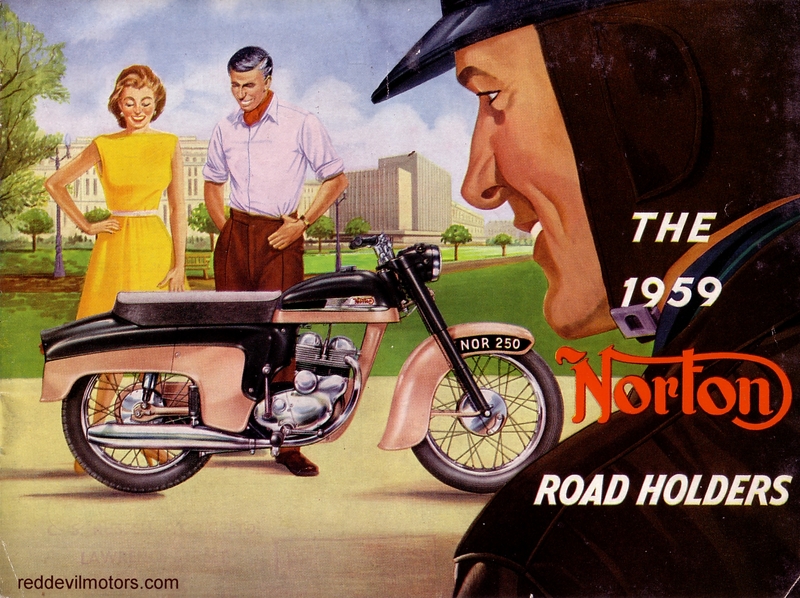 1959 Norton brochure rear cover. 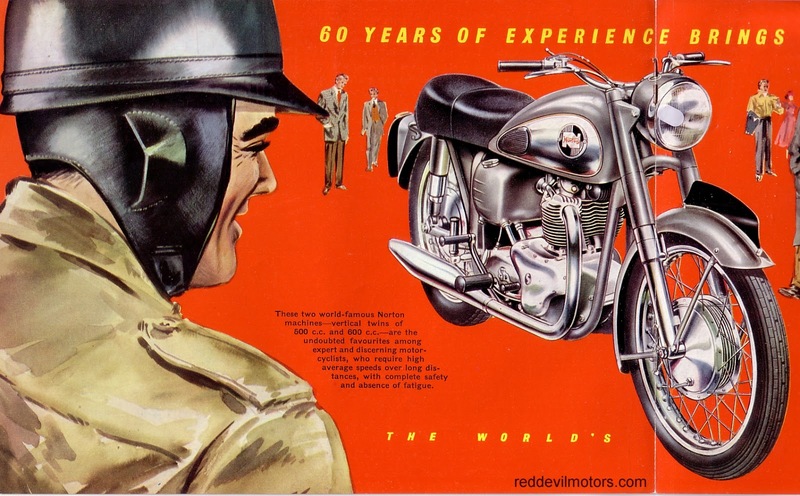 The success of Lewis Leathers has prompted the revival of a couple of other old favourite British motorcycling apparel brands, Mascot and Gold Top. 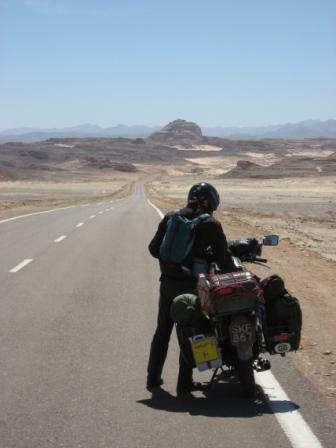 A good friend turned up on their bike with a pair of sheepskin lined Gold Top gauntlets a while back and I felt envious ever since. Luckily Santa Claus does indeed listen and Christmas Day under the tree these babies awaited me. I've had the chance to use them for a while now. They look the part and are nicely made. 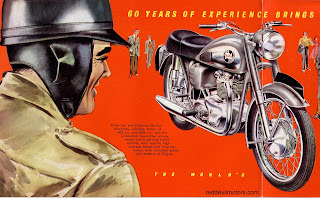 The leather is spectacularly supple and the sheepskin lining toasty. They have, frankly, the waterproof qualities of a string vest but I guess you have to sacrifice something for style. 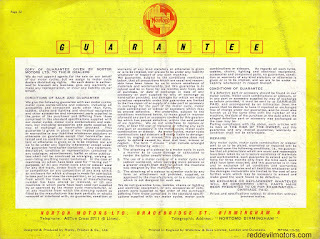 Regarding protection, I think the best we can say is that they will offer it at vintage bike speeds. I had some concern that they would come off in a spill but if you can be bothered to tighten the strap with the popper each time you put them on you should be ok. This is how a gentleman travels. 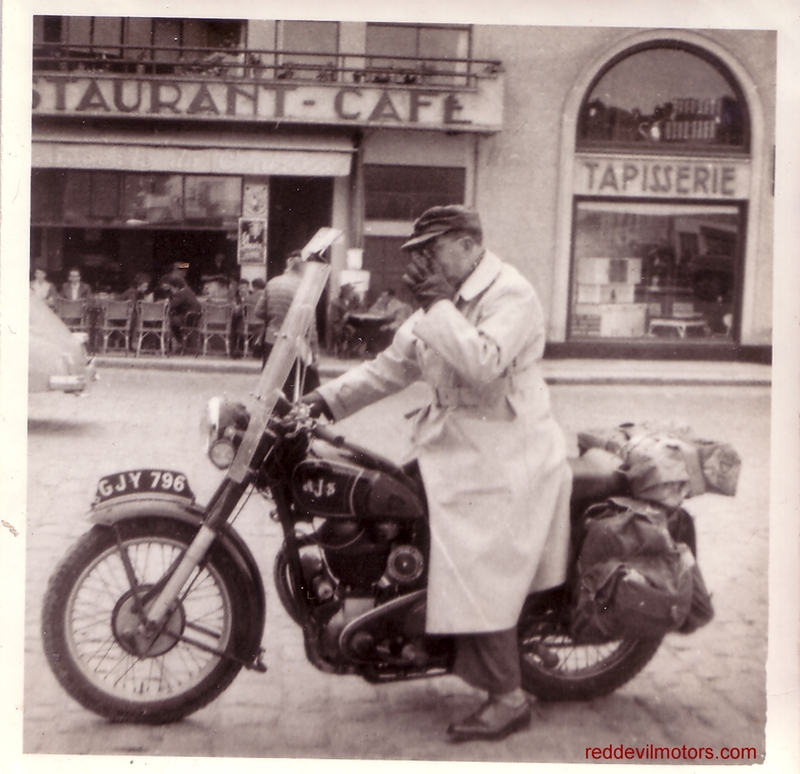 Mid fifties AJS nicely kitted out for touring from a time when a smart pair of trousers, brogues, a cardigan and a gabardine mac were considered the ideal motorcycle adventurer's outfit. How does he manage to stay so clean? Looks like he is enjoying himself. Charming pictures. 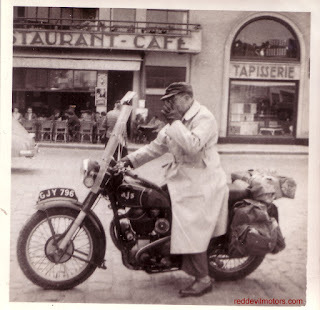 AJS touring in France or perhaps North Africa. 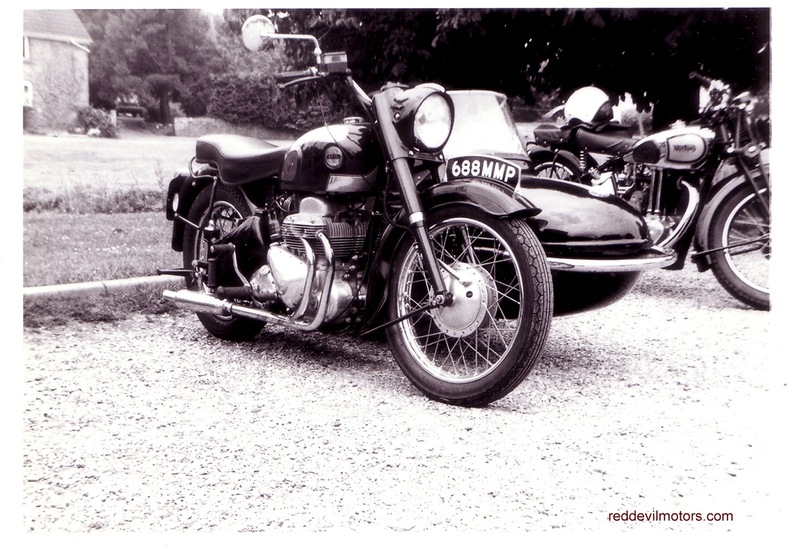 Several more pictures from vintage events in the seventies and eighties. Thanks are due once again to Bettie Barber for letting me scan pictures from her family album. were all in the Barber collection. 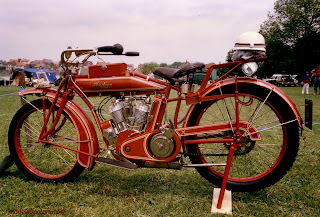 Stunning Indian Power Plus c 1914 / 1915. 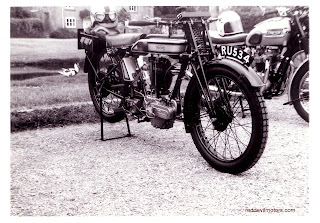 Mk II Ariel Square 4 combination. 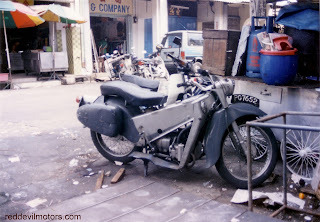 I'm a sucker for period accessories, a regular ebay bargain trawler and own a BMW that doesn't quite have the handling to match it's power. 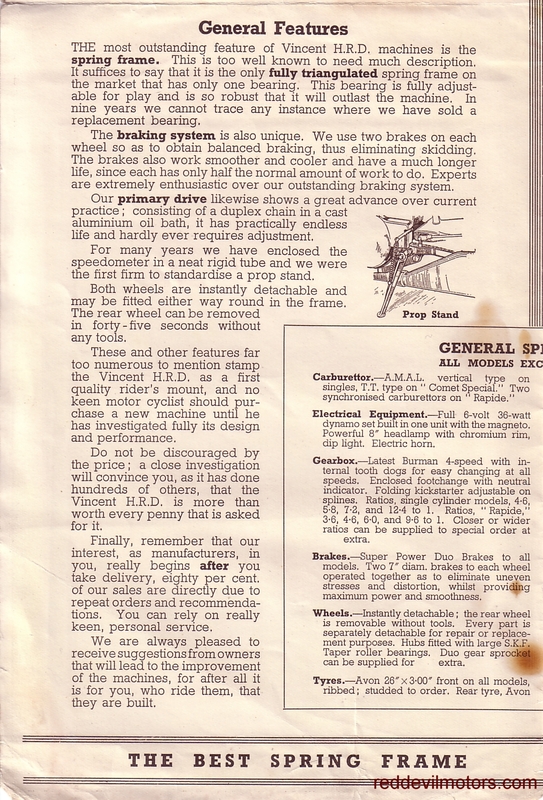 It was just plain inevitable that I would end up with a fork brace for the '76 RS. 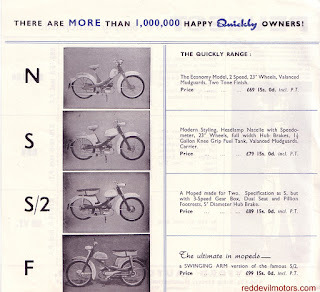 Very much of an era the fork brace was the child of wobbly seventies and eighties Japanese frames and once upon a time as popular as a set of expansion chambers. 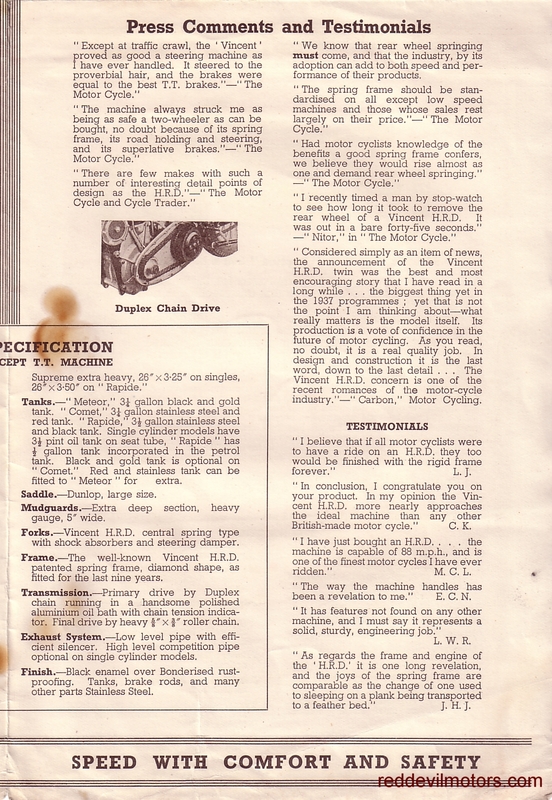 Never mind that the logical steps to making my Beemer decent handling would be new fork springs, rear shockers and a fresh set of tyres. 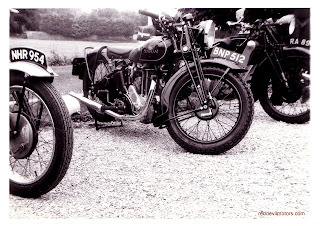 These would cost a lot of money, the fork brace was a mere tenner. I feel this is very much in the spirit of the era. The brace I bought is made by San Jose BMW from the States. This is the early version in two pieces, more recent ones come with a cross piece that holds them together. 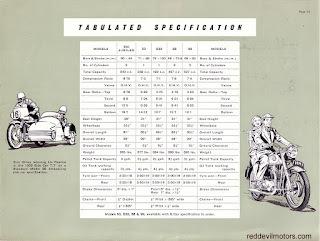 The first thing that you notice is that it is a heavy item, mmmm..... unsprung weight. None-the-less I plowed on and fitted them. 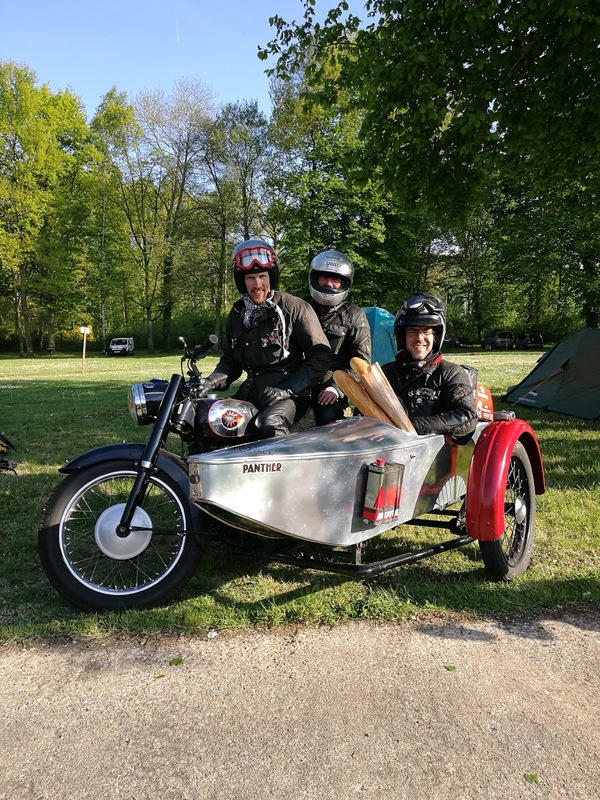 Before anyone mentions, I know that the plastic bolts holding the mudguard on are number plate bolts - they came with the bike. 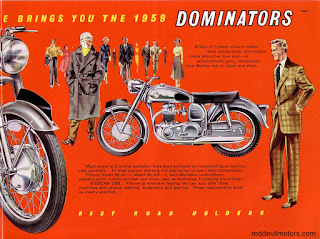 I have since bought a nice set of shiny stainless bolts. The net result? 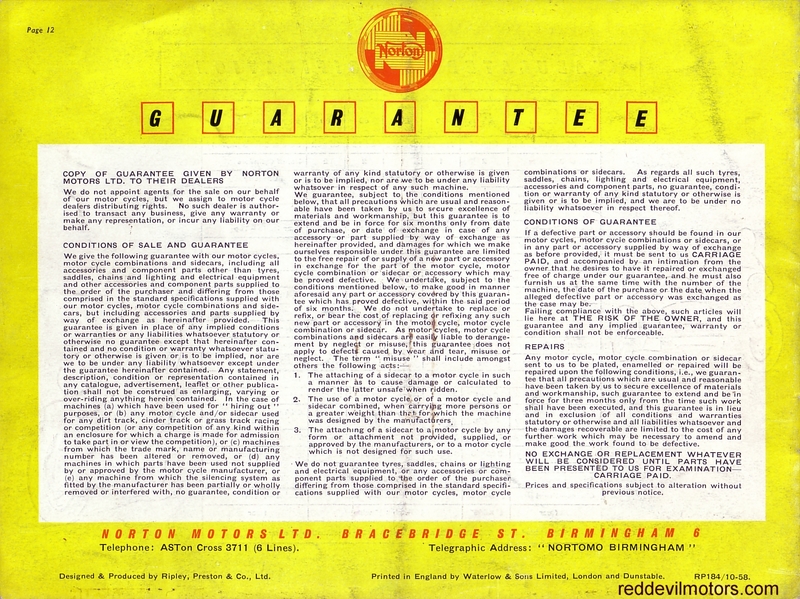 Yes, absolutely no discernable difference in handling. Anyone out there got a cheap good set of dial-a-rides and progressive fork springs? line was very slightly off. That's better. The correct way around. Period accessory. Yes. Different. Yes. An improvement? A veteran with wicker sidecar being used as a studio prop. 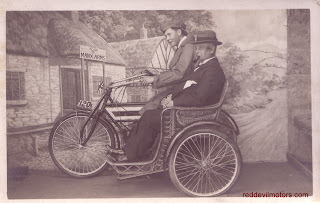 The postcard is dated 1909. 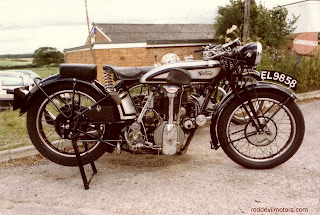 I've got no idea of the brand of bike. Please comment if you've got a positive id on it. This new to me Record number 34 vice has somehow brought a level of happiness to my life greater than anyone could reasonably expect from so humble an item. Perhaps it is because the vice is one of the most used tools in the workshop, perhaps it is because what it replaced was so very awful. The former vice in my life was both worn out and ill positioned. I had never thought whilst putting together my workshop a couple of years back just how inconvenient a poorly-sited vice could be. I had the former vice pushed way too far over to one side of the bench thinking how wonderful it would be to have a large area of bench clear. We learn from our mistakes and I now know that nothing is better than a solid, quality vice sitting squarely in the middle of the bench. Here's hoping for many productive years of happiness together! 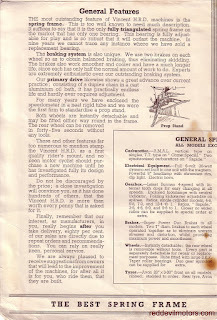 "Love your new vice but us boring old ex-tradies will look at how you've mounted it and tut-tut. The edge of the rear fixed jaw should be just a whisker in front of the edge of the bench so long work can hang comfortably. Eg, cleaning up the thread on a brake rod. The ideal height should be set with the top of the vice at the same level as the point of your bent elbow. Get it like that and vice work is a joy. As it is you'd give my old apprentice master palpitations!" Newly installed Record number 34.
it was cute but yes, correct, I never use it! Am I turning in to an old fart? 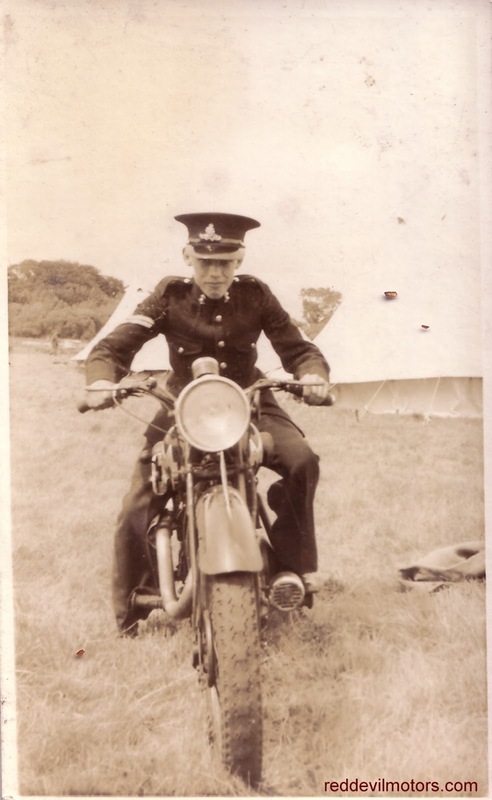 This young whippersnapper wearing an officer's uniform appears to be about fourteen years old. Either way he is posing with a nice sporting early thirties Matchless. Bell tents in the background and check the unusual tread pattern on his front tyre. 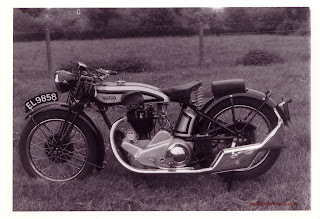 Posing with a thirties Matchless. Here's an interesting autojumble find. 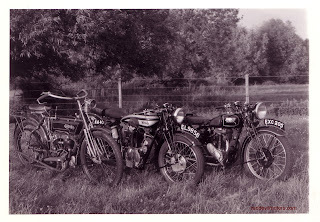 Even back in the day bike theft was a problem as was petrol theft. Nowadays bikes tend to be chucked in to the back of a van for a quick getaway but in previous generations I guess the preferred method was just to start up and ride off what with no ignition key to worry about. Over in India the lockable petrol tap is still a popular accessory but comes with a key. 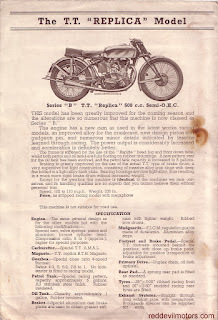 They're pretty good devices, I've fitted a couple to Indian Enfields. The CEAL tap dates from the twenties. 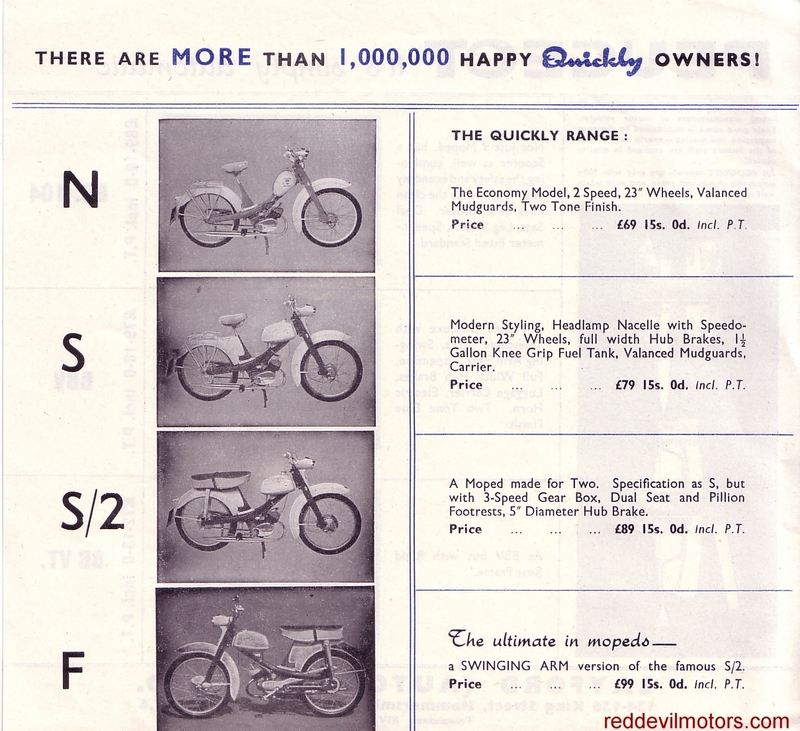 The concept is simple, the tap has no clear on and off, petrol will only flow in one position of the ten available. To set the tap from new you take off the dial, find where the open position is and then put the dial back on with the number of your choice facing the on position. 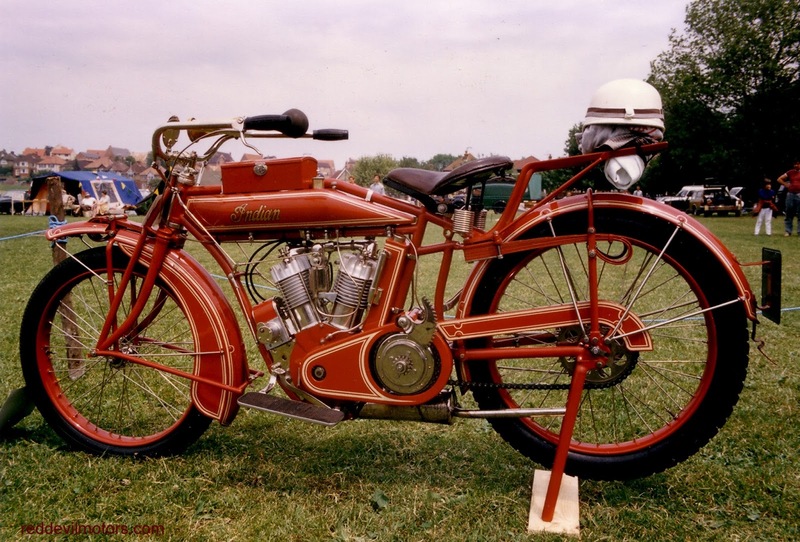 Of course the security flaw is that the thief could just take the dial apart or try flooding the carb in each of the ten positions. I guess it's a mild deterrent rather than Fort Knox level security. A nice touch with the CEAL tap is that there is a gravity filter that you can easily take apart to remove sediment from time to time. 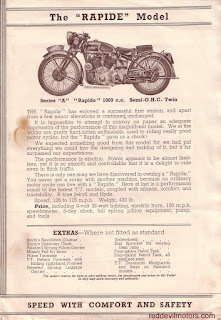 I'm all for period accessories, way more interesting than standard catalogue restorations and more evocative of bikes that people actually rode. I bought a pair of these and they will eventually find their way on to a couple of vintage projects lurking in the shadows of the workshop. I was sorting out old photos recently and came across this one. 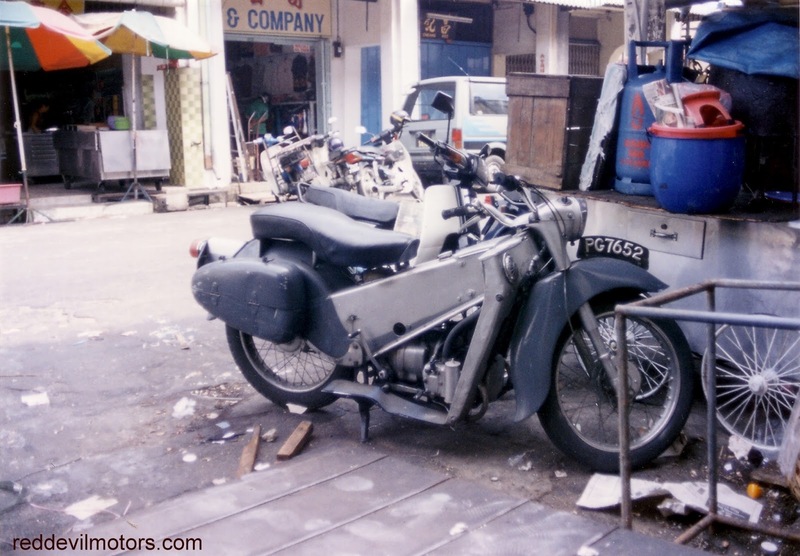 It was taken back in 1995 in George Town, Penang, Malaysia when I was on a backpacking trip around Asia. The bike looks well looked after and has the stylish and rare streamlined pannier set. 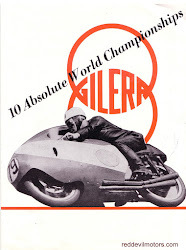 Wonder if it is still around? 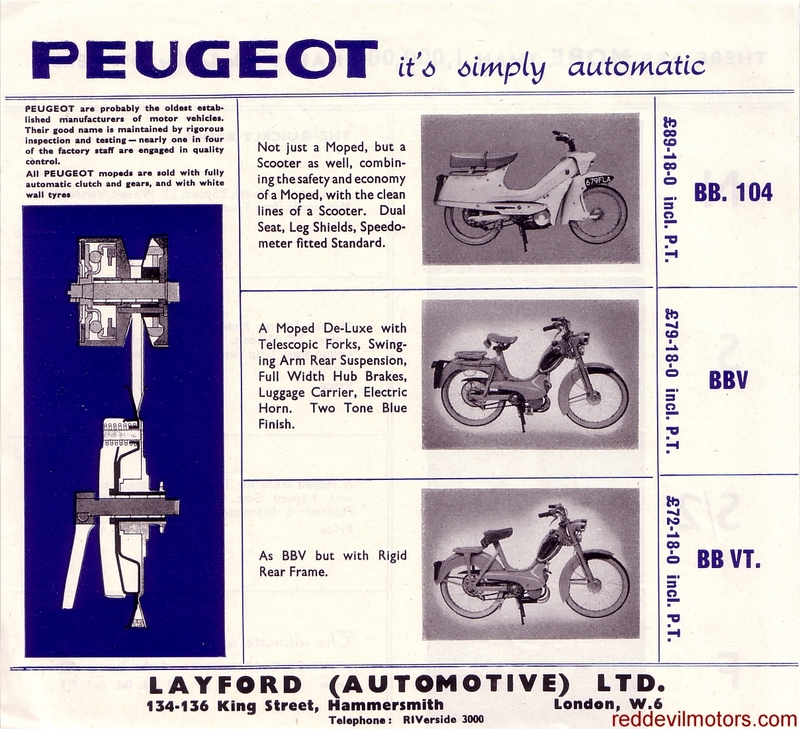 Layford Automotive of Hammersmith were the UK importers for a number of different continental mopeds. 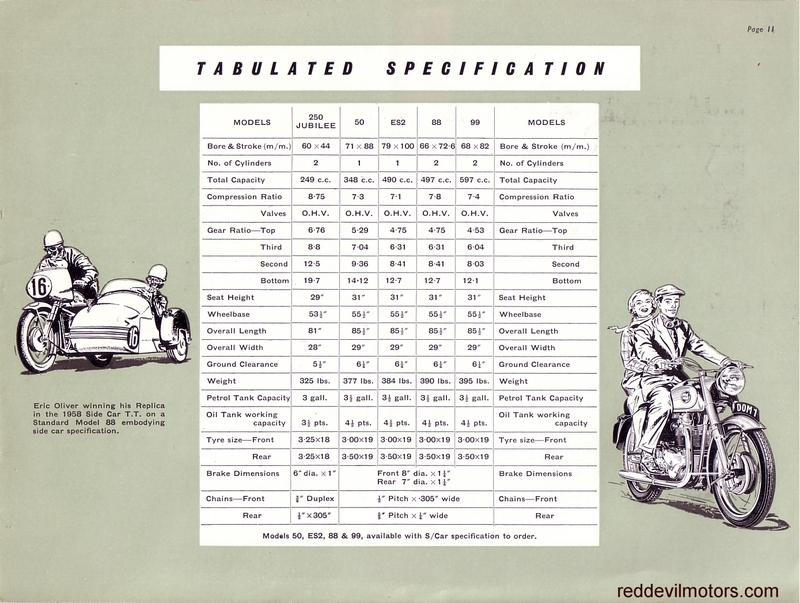 This brochure promotes both the NSU Quickly and the Peugeot BB ranges. 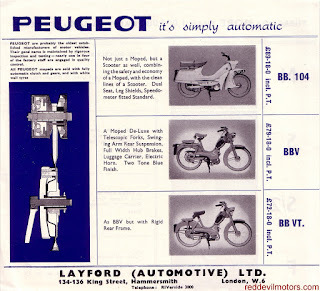 Strange to have two competing brands on one advert but I guess Layfords didn't mind too much which they sold. 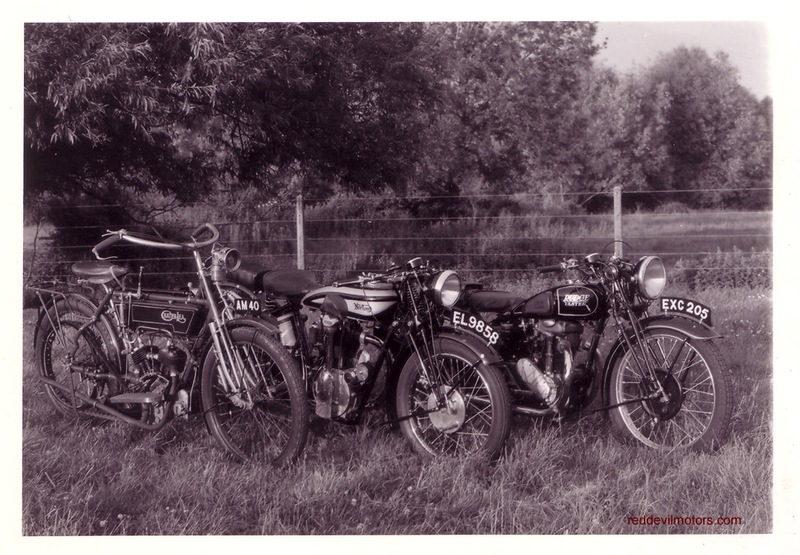 The 1936 Vincent HRD range. 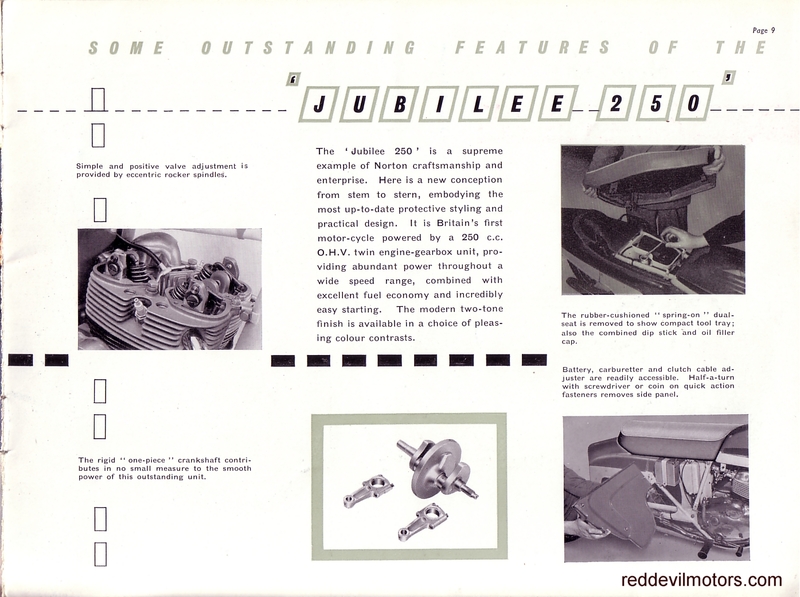 A surprisingly modest brochure given the product. 1936 Vincent HRD brochure front cover. 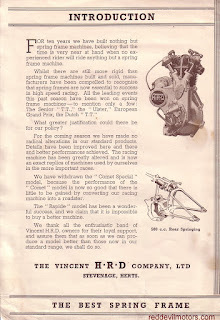 1936 Vincent HRD brochure page 1. 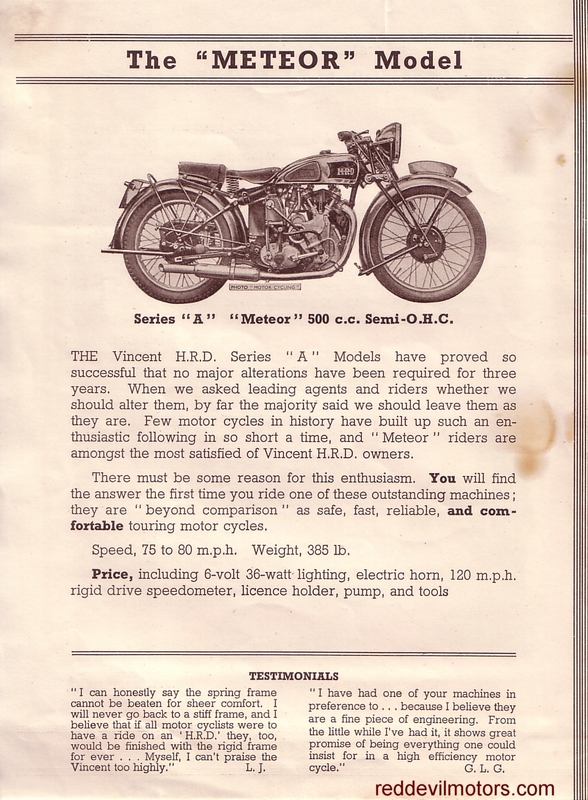 1936 Vincent HRD brochure page 2. 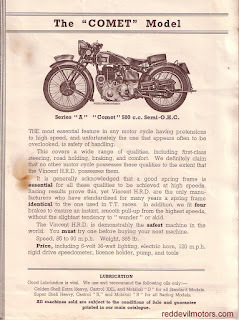 1936 Vincent HRD brochure page 3. 1936 Vincent HRD brochure page 4. 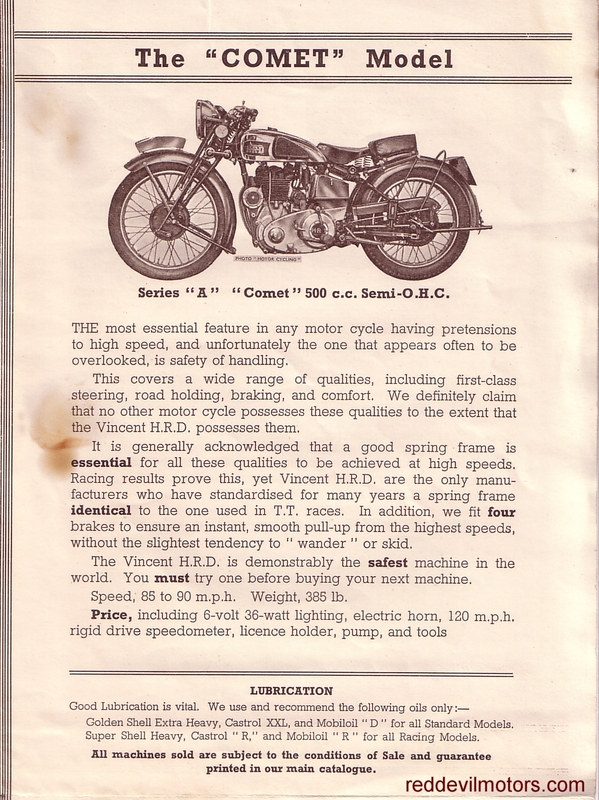 1936 Vincent HRD brochure page 5. 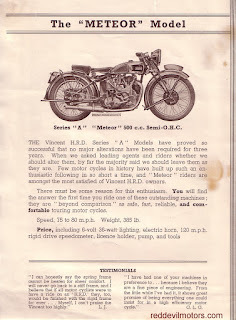 1936 Vincent HRD brochure page 6. 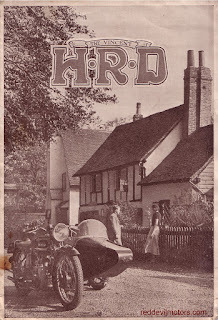 1936 Vincent HRD brochure rear cover. 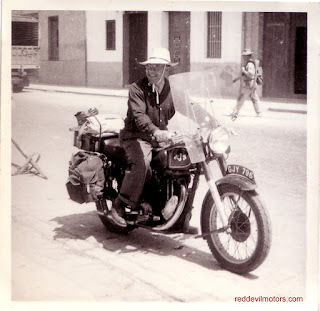 Many thanks to ex-President of the VMCC, Bettie Barber, for lending her photo album and giving permission to copy images to the blog. 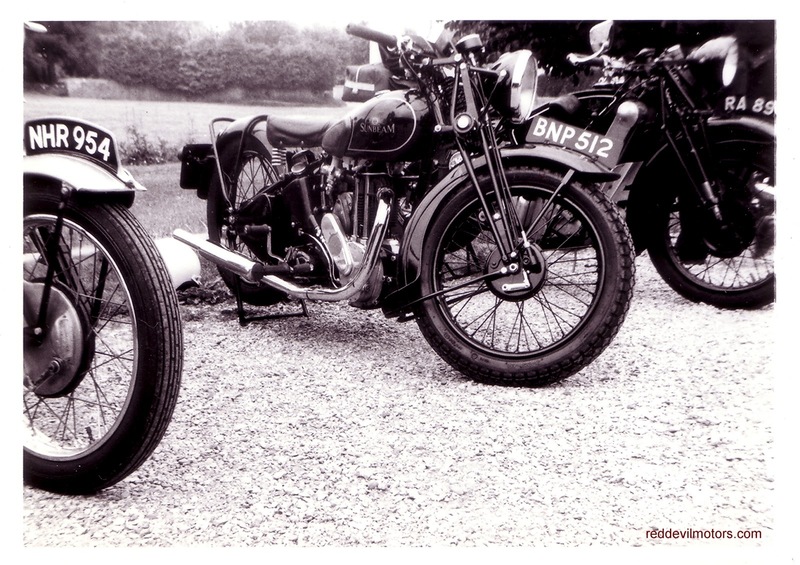 This first small selection of pictures comprises pre-war Nortons from the album. The photos were all taken in the seventies and eighties. 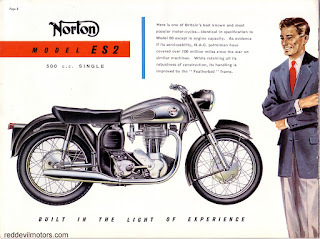 Cracking Model 18 Norton. 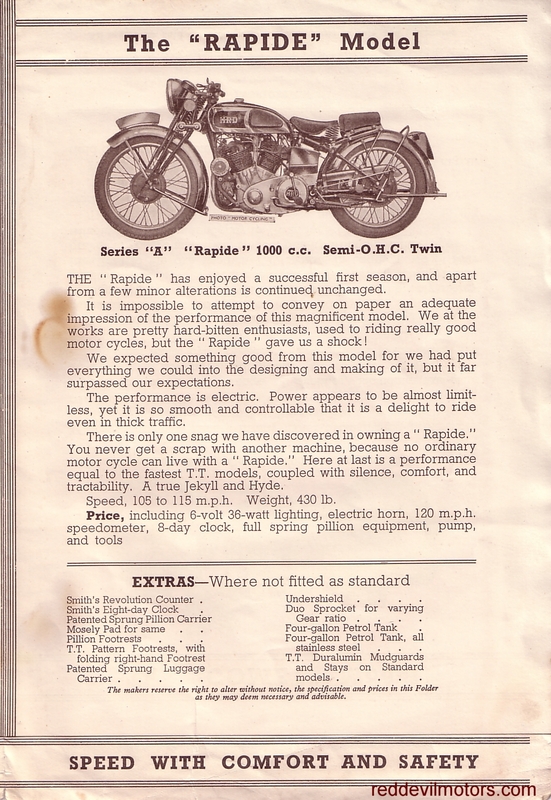 I believe it is a '26 machine. 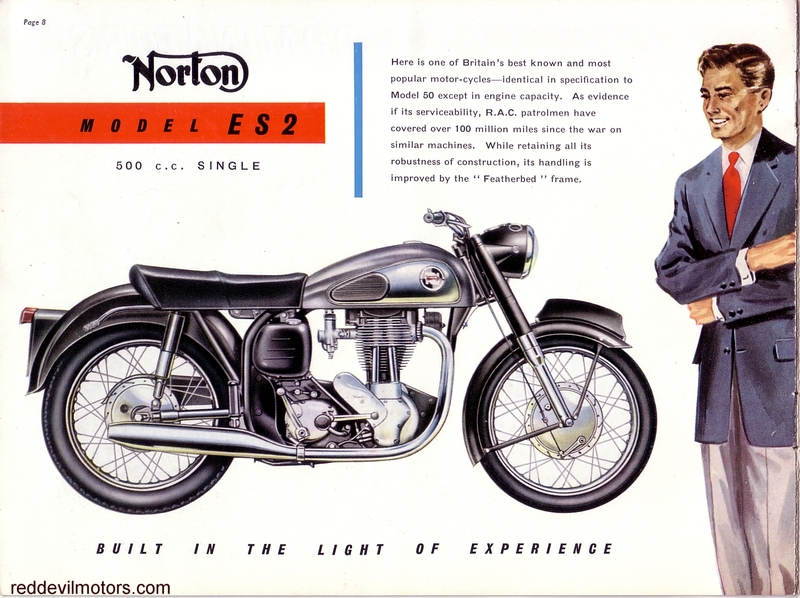 This Norton CS1 was once in Brian and Bettie's collection. Other side of the very lovely CS1. It's a bit over a year since I bought and reviewed these Rukka three finger gloves so it seems like a good idea to see how they are getting on. The answer is very well. I normally wear them without an inner glove but on occasion of proper freezing temperatures I've been using an inner and my hands have never been cold whilst wearing them. Comfort is good and so far durability has been good too. They are still waterproof, can't say they've seen a great deal of really heavy rain as I ride for pleasure so tend to avoid the downpours if I can. Warm and dry fingers are hard to put a price on but overall, though a fair whack to buy, I would say these Rukkas have been good value.